Vehicle Registration is $20 from 10am to 1pm. Open to all Cars, Trucks & Motorcycles. First 100 vehicles will receive a Dash Plaque and Goodie Bag. Over $400 in Door Prizes will be given away! Awards will start at 3:30pm. 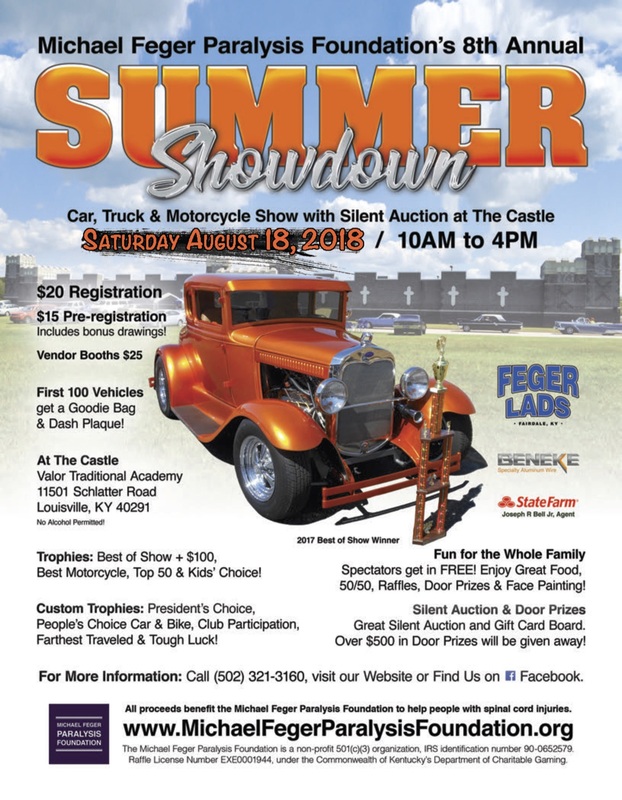 Trophies will be given to the Best of Show + $100, Best Motorcycle, People’s Choice Car/Truck, People’s Choice Motorcycle, President’s Choice, Kids’ Choice, Club Participation, Farthest Distance Traveled, Tough Luck Award & Top 50. We will also have a Silent Auction, 50/50, Gift Card Board, Raffles, Over $400 in Door Prizes and free Face Painting. We have over 100 product sponsors supporting the car show and silent auction. There will be several local vendors there to checkout. All proceeds benefit the Michael Feger Paralysis Foundation. We are a 501(c)(3) non-profit charitable organization. Our mission is to help people effected by spinal cord injury and related diseases in Kentucky and Southern Indiana. We greatly appreciate all your support and donations. Help change the life of someone living with a spinal cord injury!